Mattel's WWE Legends line has been one of my favorite action figure lines since it debuted in the Summer of 2010. I've collected most of the line and been pleased with nearly all of those figures, but that doesn't mean they've all been fantastic figures. Delivering action figures based on beloved, former WWE Superstars is difficult, to say the least, for many reasons, including: which era should the figure be based on, what accessories to include, what wave he should be released in, etc. 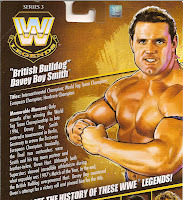 The British Bulldog was a figure I was looking forward to, but turned out to be a figure I wasn't very satisfied with. Let's take a look. This figure is by no means my defnitive Davey Boy Smith figure, but the worst thing about it is the first thing you look at: the face. It just doesn't look like DBS to me. I think the BIGGEST problem is his nose. It looks way too big when you compare it to the card art. I don't know how Mattel goes about sculpting the deceased Superstars, but they just didn't capture the Bulldog's face very well here. I don't envy Mattel's WWE design team in the least. Putting aside the difficulties of action figure production, agreeing on which version of a particular character (or Superstar) to make into an action figure can be frustrating. Moreso when you have to create a version more than just a small percentage of fans want. If Mattel had asked me, "Which version of the British Bulldog would you like to display on your shelf? ", my answer would have been, "his early '90s look with the braids and long blue & red tights." I don't think I'm alone in considering that to be his definitive look. However, Mattel decided his pre-Attitude era, Hart Foundation look was more appropriate, or wasn't as widely produced as other versions. Sure, he's still sporting plenty of Union Jack garb with his shorts, knee pads and boots, but the slightly older, and shorter-haired look just doesn't capture DBS during his peak. The British Bulldog was always an impressive physical specimen and the figure does well in capturing his awesome physique. He utilizes the upper torso previous seen on Stone Cold Steve Austin and his wavemate, The Rock. However, DBS borrows the huge, super-toned arms of Jimmy Snuka and the Ultimate Warrior, giving him his monstrous biceps, perfect for power-slamming opponents! His legs are shared with another Series 3 figure, "Hacksaw" Jim Duggan, keeping British Bulldog from being too tall compared to other figures. The arm tassels were later remolded in white for Ultimate Warrior, but on DBS they're molded in blue with black paint used for the second layer. Unlike the Warrior's boot tassels (which were molded as the boots), Bulldog's are a separate rubber pieces that fit over the standard laced boots and can be removed with minimal effort. These are molded in white with blue paint around the top edge. The paintwork on Smith is fairly well done. His shorts and knee pads are molded in blue and red plastic, respectively. They all feature the British flag tampographed in red and white, with sharp detail. The knee pads also have blue paint on the front padded area to replicate the blue field of the Union Jack. DBS' boots are molded in red plastic and, although mostly obstructed by the rubber tassel pieces, feature painted shoelaces along with the boot soles. 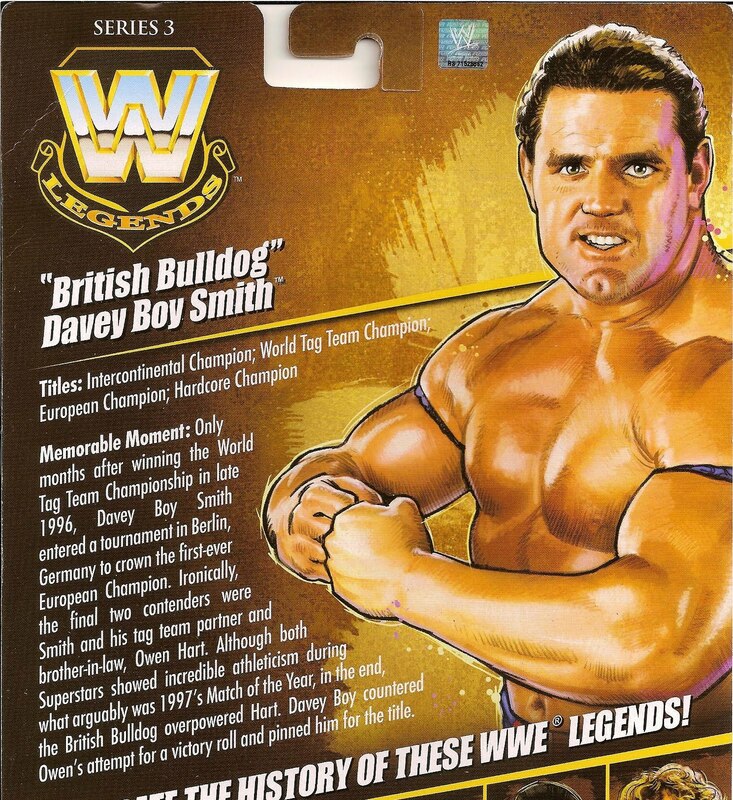 The British Bulldog is part of the last wave of WWE Legends figures to include the display stand/name tag combo. His ture accessory is his black entrance vest. It's a little fancier than Stone Cold's famed entrance garment, so it's made of a leather-type material and features a collar and zipper. The "zipper" is actually a silvery material stitched into the seam on each side of the vest. The vest is thin, but durable and very well constructed. The Bulldog's logo (?) is printed on the back along with "HART FOUNDATION" below it, letting us know where his allegiances lie (if you didn't know, Bulldog was married to Bret & Owen Hart's sister, Diana, until 2000). I don't have any particular attachment to this version of DBS, except maybe that it was from the time when Bret Hart was screwed out of the (then-)WWF Title and the company. And that's not really worth remembering. I can understand if Mattel wanted to skip the braids and cape look, but I feel at the very least, they could have based this figure on his time as the first-ever European Champion, giving us the Euro title in the process. Seems like a missed oppurtunity to this fan. After the Series 3 line-up was revealed, two of the figures were easy passes for me, Brian Pillman and British Bulldog. I have nearly zero recollection of watching Pillman, in fact, I mostly remember him limping around on crutches and then it seemed like he passed away. I'm not sure how accurate those events are in my memory. But Bulldog was going to be an easy pass because of this version. Why did I change my mind and buy him? Two reasons: TRU lowered the price of Legends (to $12.99) and the McMahon figure promotion. At over $15, I could live without him, but $13 and change seemed like a deal to me and benefits the Legends checklist. If you can look past the head sculpt (or if it doesn't bother you), "British Bulldog" Davey Boy Smith is a solid figure with nice details and accurate to the look Mattel was aiming for.